. . . at the end of 2006, I had been dabbling with Oil Painting for about 4 years, and it had become more than just a meditation. 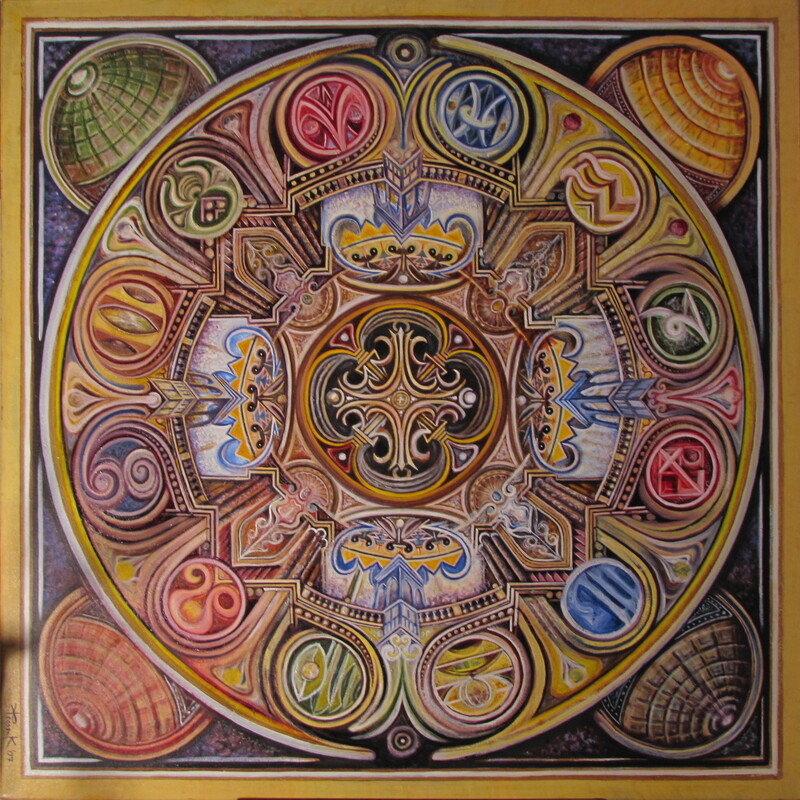 My work with Mandalas had become a practice within my life, both Black & White as well as with Color, and had been very instrumental in helping get my life in order. But beyond that, I began to wrestle with the thought that maybe there was actually something to my work, something trying to come out. I had found a voice and it wanted to speak. Not an angry one, but one that saw the fullest potential that resided in the hearts of beings. One that paints the metaphorical heavens they wish to reside within . . . and through these visions I was exploring the connections between all thing . . . but I had one issue, I could not finish anything, or bring anything to what could be considered a presentable or finished painting. I was great at starting paintings, but after a couple of sittings, would put it off to the side and start a new adventure. By this point I had accumulated about two dozen or so of these unfinished works.
. . . so, I devised a plan for 2007. I would focus one one big work, and my only goal for the entire year was to finish that one piece. If I could not do that, then there was no way I could even consider myself being a professional artist. At the time I was studying Astrology (and still do) so I decided to paint an Astrological Wheel, which became known as the Wandering Wheel.
. . . it was around this time of the year, I announced on my LiveJournal to all my friends that next year, I would complete a MasterWork . . .
. . . at the end of the year, I collected the photos from all of the updates I posted and put them together into a small video called, Wandering Wheel . . . It is hard to believe that I will be starting my seventh MasterWork this January . . . Yes, within the Zero-field, we come to awareness within a singularity. In that instant, a spark centers our Universe, and every direction is outward, as standing at the North Pole, every direction is South. The singularity is simply a frame of reference, a vanishing point on the horizon, that is infinitely far, and at the center of our thoughts, both behind us, and in front of us. When we first come to a sense of awareness, we look at the world as it revolves around ourselves. Everything we see and sense comes as a reflection of ourselves, that is we percieve what we are seeing based upon what we know about the symbols that manifest before us. We see infinity for the first time. The duality reveals itself when we realize that there is a second infinity that exists behind us, or inward, which we currently can only trace as a path back to the singularity that exists in the Big Bang. The next realization is that both infinities are the same infinity, and our consciousness exists at the crossroad of a spiral path intersecting itself at right angles. This is simply a metaphor for gazing into a mandala, and what you will see. And being that mandalas are one of the dimensions in my artwork, you can take the above as directions on how to look at my artwork. Chaos. That is the only constant state from which we build our existence from, leaving a sense of Order in our wake. We don’t make Order, as is often thought, as a way to eliminate Chaos, but we create Order just to figure out where the Hell we are, and the hope that there is some reason why we feel the need to think these speculative thoughts. We each find the way that best suits our needs as we make this ascension, or growing out of this Chaotic Dream. For me, it is Art, or better yet, the Act of Creation, that is feeling a sense that everything that manifests through me adds a sense of beauty to this Universe we are all creating, everything benefits everyone. It is a spiritual path that naturally evolved through my interests and passions, and a tool to work as my version of Indra’s Net, to help me catch those thoughts that are important to me as I rip down the walls that I have imprisoned my God within, and setting him free to explore the un-Limited Universe, and letting the Goddess in, whom which I have kept out for so long. This spiritual deluge has overwhelmed me during the past 5 years, and pushed me well outside the edge of Order, floating far into the Chaos that still surrounds us. My art is the ladder I am creating to climb out of the Sky, and put my footing back on Ordered ground. All art is a version of this. The Artist flings themselves as far as they can handle into the Chaos, and paints a way back to reality. Some of us get lost out there, some simply lose there minds. What gets created in our culture as Art is a photo of the Artists travels, however, if the Artist doesn’t make it back, we never see what they saw, and so few really return. Most get lost at the first step, or get lost in the fear before the journey, so they only explore with their dreams. But artists want to live within their dreams, not necessarily their means, hence the poor artist. When the artist finds themselves out in the Chaos, the simple evolution of each step they create on their journey back creates their style, and every artist finds their own style. Their style is their artistic dialect. Some copy, some invent. But most important, is that they let the journey and nature direct their style, and not force it. But what does this all have to do with why you are here. Well, it is because it is a part of how I see the world, and my art is what I see, and following the process of my artwork, its good to have a bit of the backstory, some now, but most as we go. Salvador Dali once said that if the artist understands the painting before they have begun, then what the point of taking the journey. Here is the first image of the painting, and as you can see, it is filled with Chaos. Though there is a sense of Order, even the Order does not make sense. A sort of Plasma of ideas, gestating and circulating. This is the first step into the Chaos. And when one finds themselves at the threshold of Chaos, the moment your let go of the edge of the gene Pool, it consumes you. And the harder you look for that edge, the least likely you are to find it. The key is to move to center, and not panic. But where is center? It is wherever you choose it to be. But be careful, the point you choose your singularity to be is unimportant, it is simply starting the journey that is. It is a skin that is shed for a new one as you move forward, each time, letting go of what is behind, and balancing what has just arrived. To arrive in a constant state of departure. People think Chaos is a terrible concept, that it is overwhelming, and you can never escape from it. And that is the case if you sit and wait for it to reveal your path for you. But when you decide to take matters into your own will, the Chaos is as maleable as the softest metals. Puddy in your hands for you to project your spirit into as an extension of your self. This first photo is the Chaos that surrounds me now as I realize that I am sitting on tinfoil surrounding a gigantic ball of fire, orbiting around a larger fire ball that is itself travelling across paths of other giant fireballs as they orbit a gigantic hole in the sky that is on a collision course with another hole larger than our both in orbit around a cluster of even larger holes, all enclosed within infinity. That infinity is the bubble edge that I am poking my mind outward from. I wish to create a deeper dimension to my work, and those that are interested in it. I want to take people along with me on the journey, so they can see the story revealed to me as it happens. You are experiencing the art as it grows and matures. When the art is finished, you will have memories of the journey, and have an added dimension of time added to your experience. I will do my best to explain things as we go, but you are also welcomed to ask questions, and comment on any entry within this journal. This first MasterWorks is currently being called Primer. The name comes from the movie Contact, by Carl Sagan, where humanity has been sent sheets and sheets written in some symbolic language beyond human comprehension. The humans are looking for what is called a Primer, or a means that the person that wrote the documents leaves for those that follow as a way of interpreting the symbols. The primmer is found when it is revealed that the pages must fold out of the two-dimensional world that the humans see in, and into a three-dimensional text where each page is at right angles from each other. Each page builds out from the center, and what is written is revealed. Primer is the painting that holds the code for how to read my artwork, and my artwork is what I am seeing when I poke my mind over the edge or Order into the Chaos around us, and within us. Primer is also related to the word Prime, and thus, seems like a good place to start.